Karva Chauth is a fast undertaken by married Hindu women who offer prayers seeking the welfare, prosperity, well-being, and longevity of their husbands. 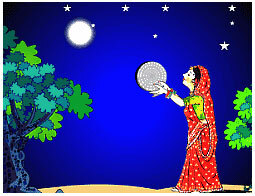 Karva Chauth falls about nine days before diwali on the Kartik ki Chauth some time in October or November. It is the most important fast observed by the women of North India. A woman keeps such a fast for the well-being of her husband, who becomes her protector after she leaves her parents home. Her husband provides her with food, shelter, clothing, respectability, comfort and happiness. This is indeed a very tough fast to observe as it starts before sunrise and ends after worshipping the moon, which usually rises at about 8.45 p.m. No food or water is to be taken after 4 a.m. or after sunrise. Nowadays, this fast is kept even in modern educated homes, becoming a symbol of the sentiment that a woman has for her husband. A sari (in the baya) is a must for the first Karva Chauth of a girl. One thing to be taken care of is that the baya reaches the girl's in-laws home, where the girl has gone during the course of the day, before the evening. The baya is given to the mother-in-law after the manasna. If the mother-in-law is not present, then the eldest lady in the house is presented with the baya. Sometimes, the elder one chooses to take only the perishable items, and leaves cash and clothes for the mother-in-law. The preparation for the puja should be started at about 4 or 5 p.m. Someone older, who is willing, or the housewife herself as the situation demands, prepares a suitable place in the puja room, in case it is a big room which can accommodate all the women who have been invited for the baya; otherwise the best place is a verandah or the open courtyard, since generally the weather is not cold during this season. The puja place is decorated with kharia matti, which has been soaked in water two to three hours earlier, and takes a semi-liquid form. A chowk like in any other puja - is decorated on the floor. This whole chowk should be placed against a wall on one side, where a similarly decorated patta is kept, on which the Gaur Mata is seated. The Gaur Mata used to be made with cowdung in the shape of a human figure, just about two inches tall. Nowadays, a picture or an idol of Parvati is placed on the patta. Just about an hour or so before moonrise, those who have observed the vrat, dress up again in their chunris or in red or pink clothes with chonp and bindi on their foreheads. Everyone now gathers around the place where a carpet or durrie is spread over the leaving space for the puja items. The baya of individual is kept on a thaali, over the karva, with a little water and seven pieces of pua in it (seven broken from one bigpua). The karva itself is dee with kharia, aipun and a little roli..A strand of (red thread) of any thickness is tied around the part of the karva. The top cover is also decorated in the thaali is placed on the cover. The women sit facing the and one elder member (there is no taboo on widow the family narrates the story and does the chanting , each woman doing the puja. This is known as man which means to give away and never take back. First of all, roll teeka is applied on the forehead of Gaur before the start of the puja. All the women doing puja also apply roli teeka on their foreheads and parting (known as maang). Everyone does pujan by dipping the third finger of the right hand in water sprinkling it with the help of the thumb three time the deity; the same procedure has to be repeated aipun and roli and, lastly, the rice is showered. depicts the bathing of the deity, decoration with a putting of the teeka with roli and, lastly, worship the deity with rice.